High schools and colleges recognize the importance of providing students with a seamless passage from one learning experience to the next. The P-TECH Rochester school links the Rochester City School District, Monroe Community College and 12 regional business partners, including the University of Rochester Medical Center, Harris Corporation, Xerox Corporation and EarthLink. These partners work together to ensure that students earn a high school diploma and a no-cost Associate in Applied Science degree that prepares them to fill high-demand jobs in the information technology field. The partners need to work together to coordinate activities across a significant number of businesses. Two people have played a key role in developing a successful and effective partnership in Rochester. They are Anthony Smith, P-TECH Project Administrator for the Rochester City School District and William (Bill) Rotenberg, Director of P-TECH for Monroe Community College (MCC). How did the two develop their working relationship? A sense of humor and persistence helps. “The only two people we could get hold of from the beginning were each other!” Rotenberg says with a laugh. 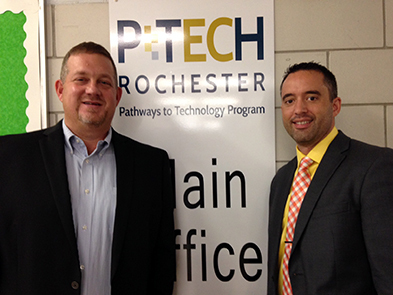 Bill Rotenberg of Monroe Community College and Anthony Smith of the Rochester City School District work closely to ensure alignment between high school and college curriculum at P-TECH Rochester. What we share is a passion for education and making a difference in Rochester children’s lives. In that spirit, Rotenberg and Smith connected early in the school development process and developed an implementation plan. They began meeting informally, interviewing one another and sharing their different skill sets, and deciding how they could support each other. Next, they began to map out the work that needed to be accomplished. This included developing the Scope & Sequence and the Summer Bridge program, and laying out the internal processes that needed to take place to launch the P-TECH 9-14 school. 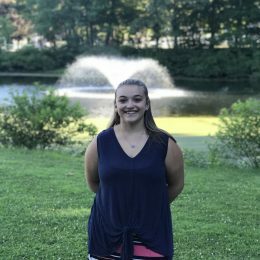 Throughout, their work has been supported by a larger Steering Committee made up of key leaders from both the district and MCC, who are tasked with providing guidance and advice and doing the strategic work necessary to ensure the school’s success. For more information about the P-TECH 9-14 model, please visit The Model. 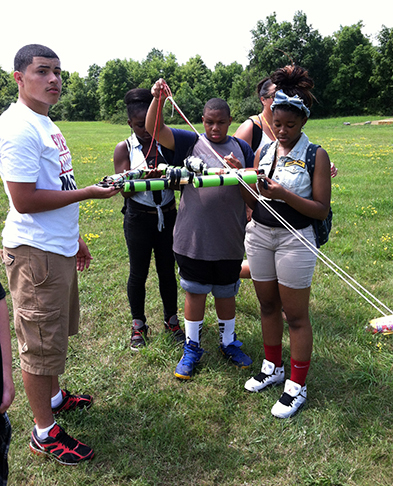 P-TECH Rochester students in class.